Armed with a lifetime passion for flyfishing, Temple Fork Outfitters set out to establish a new standard of value for fly rods. They have relied on their own experience and advice of many professionals in creating what they believe is the perfect marriage - price and performance. Sound too good to be true? Cast one and you be the judge. "Lifetime Warranties" on fly rods are worth little for rods that stay in the closet, and they are definitely a poor substitute for fly rod performance. 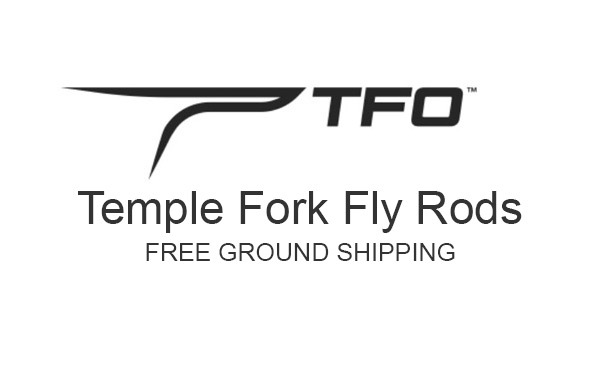 For some of you, TFO might be your only rod, and for others who might be adding to a portfolio of rods, we expect a Temple Fork Rod to become a favorite. Temple Fork Outfitters rods prefer to spend their time fishing, and thus face greater odds of breakage their No Fault Lifetime Warranty will repair or replace your rod for a reasonable shipping and handling charge for the life of the registered owner. Temple Fork has an exceptional group of Advisory Staff members with decades of experience. Not only do they provide TFO with insight to improve products, but they also spend countless hours traveling the world and sharing their knowledge and experience with others. Those staff members include Lefty Kreh, Bob Clouser, Nick Curcione, Ed Jaworowski, Jim Teeny, Gary Taylor and Wanda Taylor. Little River Outfitters has been selling Temple Fork Fly Rods and servicing TFO customers for years. If you don’t believe a Temple Fork Rod will meet any angler’s expectations and save you money, come by our store and cast one. Or order one. If you don’t like it, send it back. Order from us and the ground shipping is free. Thank you for supporting our store. We have been family owned since 1994.